Congratulations on your admission to Appalachian! We are excited that you are considering being a Mountaineer. Now that #AppSaidYes, we hope you will too! Here are some of your next steps. To submit your acceptance agreement and pay your $200 enrollment deposit, log in to your MyMountaineer portal. When you do that, you will officially become a Mountaineer! Transfer students should consider attending T-POP. 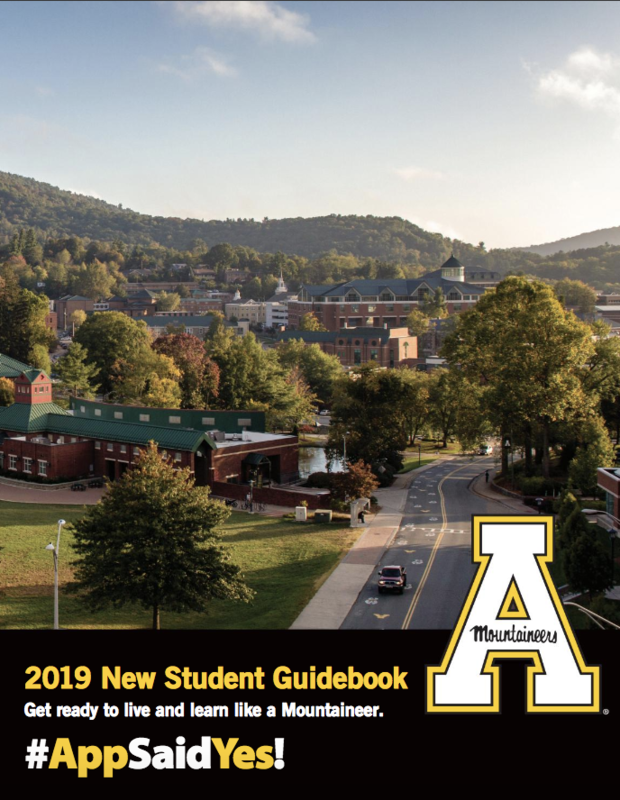 From your Early Registration Advising (ERA) course to immunization and insurance, view your enrollment steps checklist in your MyMountaineer portal for a list of steps to ensure a happy and healthy start to your college career at Appalachian! Now that you’re admitted, you have been assigned an Appalachian email account. Appalachian uses private GMail services – learn how to login below. The first step to accessing your Appalachian email is establishing your password. Once you do this, you can access your Appalachian email from anywhere via mail.google.com – just remember to enter @appstate.edu after your username. On the next page, you will enter your username (without @appstate.edu) and your password. If you are already logged in to another Gmail account, you'll need to click "Add Account" in the top right of Gmail or "Sign in with a different username." It's important to check your @appstate.edu email for notifications from Financial Aid, Housing, Orientation and other on-campus partners. Establishing this password will also set your password for your AppalNet student portal (see step 2). During the application process, you have used your MyMountaineer portal to monitor your application status. Between now and when you enroll, you can continue to check your MyMountaineer portal for an updated list of all of your enrollment steps. In addition to checking your MyMountaineer portal, you will need to begin checking your AppalNet account – a portal that enrolled Appalachian students use to register for courses, monitor financial aid and pay tuition. You will access this account with the same login credentials as your Appalachian email account. Explore the many types of financial aid available at Appalachian. If you're interested in financial aid, submit the Free Application for Federal Student Aid (FAFSA) by the priority deadline and include App’s school code: 002906. If you've submitted your FAFSA and included App, you'll see a Financial Aid tab in AppalNet. Click "My Eligibility" to see any missing requirements for financial aid and click "My Award Information" to view your financial aid package when it is awarded. If you don't see a Financial Aid tab, Appalachian has not yet received your FAFSA. Appalachian has more than 400 student organizations to get involved with on campus and within the community. Explore opportunities and learn about ways to get involved! On-campus housing is required for first-year students and transfer students less than one year out of high school. Housing for transfer students who are not required to live on campus is limited, so these students should apply early. Appalachian has 20 residence halls and many residential learning communities (RLCs) to choose from! The housing application will be available once admitted students confirm their enrollment and establish their App State credentials. Transfer students awaiting a credit evaluation and degree audit (Degree Works) will receive an email that their evaluation is complete within three weeks of admission. First-year students with college credit will receive an email with their evaluation after confirming their enrollment. Why App? Students at Appalachian have a multitude of majors and programs to choose from, numerous internship opportunities, and the chance to get involved with research in their specific fields. Check out #WhyApp on social media to learn why current students chose to be a Mountaineer! Beginning to build your Appalachian community is the first step to getting plugged in at Appalachian. Incoming first-year students should join the Official Appalachian State University Class of 2023 Facebook group. Incoming transfer student should join the Appalachian State Transfers Facebook group. For up‐to‐date information and student stories from the Office of Admissions, follow our social media. Visit – or visit again! We have events specifically for admitted students. Plan your visit and experience Appalachian for yourself. Can't make the visit in person? Take a tour from the comfort of your home with our virtual tour. Appalachian offers more than 150 undergraduate and graduate majors. With an average class size of 27 students and a student to faculty ratio of 16:1, Appalachian's small classroom environment allows students to easily interact with their professors and each other. Start exploring majors now.